12.03.2018 18:45:35 - Switzerland-based Zach Prather launches his latest single Break Away after performing live from his studio while recording. (live-PR.com) - Zach Prather, based in Switzerland, is a blues funk artist and singer-songwriter who has worked with renowned acts including Mick Jagger and Etta James as well as Screamin’ J Hawkins and Willie Dixon, who have been part of Zach’s journey to create his own “B Funk” style. been produced by icons of Chicago Blues such as Willy Dixon as well as Horst Lippman, founder of the American Blues Fest for two decades from 1962 and credited with bringing American blues to Europe. Across his career, Zach has been signed to various labels for various projects including Universal Music, Areola Amercia, Dixon Landing and two imprints based in France: Taxi Records and Melode/Encore. Over this time the producer of Earth Wind and Fire, Denise Williams and The Emotions; Charles Stephany has recorded with Zach on various occasions. As a songwriter, Zach has written for Motown, ATV Publishing and Holland, Holland. Hit writers Holland, Dozer and Holland of Motown started the latter. Zach has recently performed live gigs over social media from his studio in Switzerland with his band The Tribe, while producers have finished mastering his latest recordings. 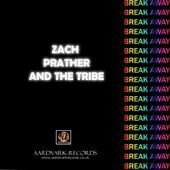 Now Zach releases his latest single Breakaway on Aardvark Records on 10th March. This is Zach Prather's first official single release on Aardvark Records, although he has worked with the label for many years on various projects. A substantial back catalogue of Zach’s music can be found on iTunes, including the tracks; Nothing Left to Say, Cold Cold Feeling (see video link above), Catch Me When I Fall, Ju Ju Man and Freak. Zach’s back catalogue can be found in various places online, including inclusion in a compilation Blues and Soul Avo, via Discogs and CD Baby, plus many references to his work. “The kind that points to one stand out feature that deserves recognition. Prather’s story telling’ voice assumes that role and his guitar backs it up. He brings each tale to his audience with a comfortable texture. Not one to over-emote, Prather prefers a funk-driven mood where he can subtly drive his band in pursuit of a story that begs to be told,” writes Jim Santella of Southland Blues Magazine. The LA Times has called Zach the: "new Bad Boy of the Blues." An artist to be experienced live, Zach Prather is in constant party mode. Guaranteed to electrify his audience.